Dungeon Siege III may be delayed, but added pre-order bonuses on the digital distribution platform Steam are a Dungeon overload. 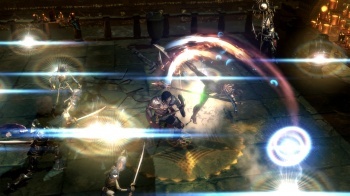 If you were planning on picking up Dungeon Siege III in May, you sadly have to wait a few weeks longer than anticipated as the game has been delayed until June 21st. However, those weeks can be easily filled for PC folk who pre-order Dungeon Siege III on Steam which grants immediate access to Dungeon Siege I and Dungeon Siege II. CEO of Square Enix, Mike Fischer, commented on the delay saying, "Although the final polish phase has demanded a bit more time than originally planned, we want to assure fans and followers that the additional effort will allow us to deliver an action-RPG worthy of its rich heritage." While the news of the delay somewhat bites, scoring the rest of the series for free isn't a bad deal, considering they aren't currently available for purchase on Steam. I'm pretty sure someone we all know enjoyed playing the game earlier this year. Having also played a few hours of Dungeon Siege III a few months ago, I can confidently say from what I played that further work on the game is only going to improve what looks to be a fun entry into the series.